Bathe yourself in adorable chaos. 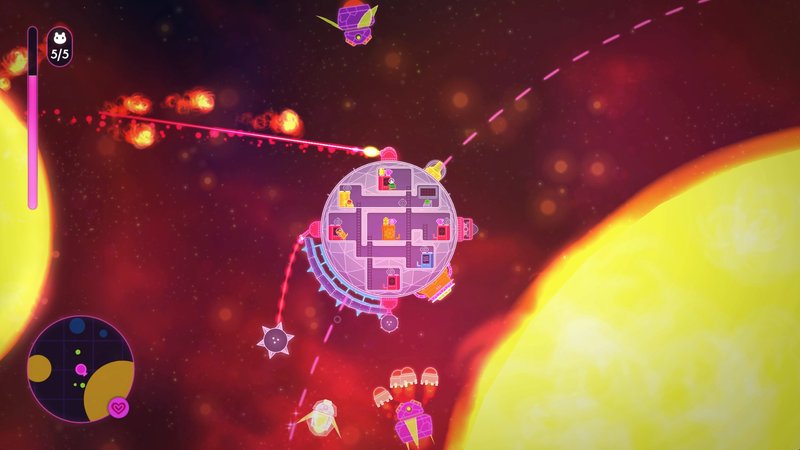 Somewhere between the vastness of Spaceteam and Artemis: Spaceship Bridge Simulator lies Lovers in a Dangerous Spacetime, a game centered around the act of yelling at your friend, flailing, yelling some more, staring at each other in a brief moment of bewilderment, and then bursting out laughing. It’s fun by way of pure, emergent chaos, and escaping from that chaos intact makes you feel like you just swiped the Mona Lisa from MI5. Building a game off this idea is one of the toughest balancing acts a developer can attempt, but Asteroid Base does so with astounding precision. Lovers’ story offers just enough to get you on your way, boiling down to the fact that you and your co-pilot must navigate the cosmos to rescue your screaming animal pals (bunnies, frogs, etc). Transportation takes the form of a circular spaceship with eight stations: four controlling directional turrets, one controlling a movable shield, one controlling steering, one bringing up a map, and one to activate a sort of super-weapon. Here’s the thing, though: there’s just the two of you, meaning you and either an adorable AI partner or an actual, physical friend must scramble around the ship to man each station as the need arises. And trust me, the need is near-constant. Using the AI partner works just fine and may even provide a slightly easier experience than in multiplayer, but doing so ignores the primary reason for the game’s existence. Lovers is built from the ground up for its two player local co-op mode, ensuring that the pandemonium emanates both on-screen and on-couch. 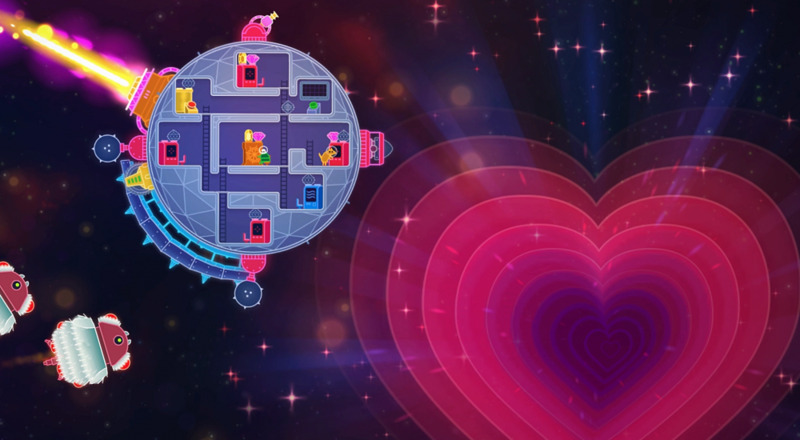 As the two of you pilot your ship around Lovers’ randomly generated levels, you’ll encounter a number of threats ranging from spike-spewing aliens to robotic planetary patrols to space… whirlpools. To keep your love-craft (heh) from becoming galactic debris, the two of you are constantly clambering from station to station as you steer, fire off weaponry, or block incoming projectiles. The erratic nature of the levels means that these threats can and will come from any direction, so what starts as inside voices and measured reactions quickly devolves into banshee wails and panicked button mashing. This is where Lovers excels, in the moments that you and your partner dance, surrounded by aliens, careening into a planet, and low on health, yet somehow, somehow, you pull it off. The chaos seems to always drag you into a state just short of sheer hopelessness, and reflecting on those moments of victory make you wonder how you even survived at all.